So, Rob's parents came to visit and we all had such a pleasant time! They really got the grand tour and seem to love Missoula. School's just started and things got off to a great start. It's so nice to be enrolled, even though I'm only taking one class. Having Rob's parents over made me excited for the possibility of my own family's visit. There are no plans yet, but I keep hoping. I'm a very family-oriented person, and have a very close relationship with my parents and siblings despite the distance. I can't wait to be able to share this place with them. I'm altogether satisfied, and just want to keep living a life that's pleasing to my family and God. I'm happy with school and feel like what I'm learning has practical application to possibly starting my own business in floral design or whatever floats my boat 3 years from now. I want to share this little arrangement with you. Someone at work anonymously brought in some beautiful sunflowers for the staff to take, so naturally I snagged a couple! 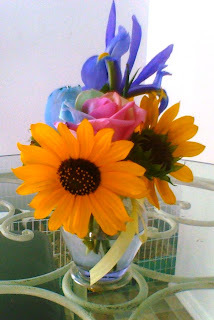 The amazing multi-colored roses and blue iris were finds from Bitteroot Flower Shop . The iris cost me $0.50 and the 1/2 doz. roses (I only used 2 here) were free with the bicycle benefits program. ---Making this arrangement cost fifty cents. The mini vase was a thrift store find (probably thirty cents) and the ribbon was free from Bitteroot. This arrangement celebrates the spirit of generosity that allowed for each of these beautiful flowers to come together in my little vase. nice. I see the rats in the background though!